Amazon has announced 10 new pilot shows, the future of which will depend on a public vote. The pilots include dramas starring Mexican actor Gael Garcia Bernal, British star Malcolm McDowell and Arrested Development's Jeffrey Tambor. Lovefilm subscribers in the UK and Amazon Prime subscribers in the US will be able to watch the shows and vote on which should be made into full series. Last year five out of 14 pilots were chosen to be produced as series. 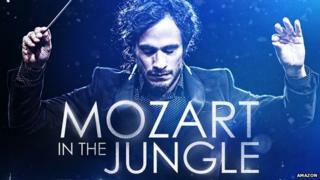 Garcia Bernal and McDowell star in Mozart in the Jungle, a comedy drama set in the world of classical music and written by Roman Coppola and Jason Schwartzman. Based on the memoir of the same name by Blair Tindall, the show looks at what happens behind the curtain at the New York Symphony Orchestra. Tambor features in dark comedy Transparent, about a family which begins to unravel after a series of secrets are revealed. The actor also starred in an Amazon Original pilot last year, comedy Onion News Empire, that was not "picked up" and turned into a full series. X-Files creator Chris Carter's new offering The After tells of eight strangers thrown together by mysterious forces who struggle to survive in a violent world. While Bosch, based on Michael Connelly's Harry Bosch series of books, follows a homicide detective pursuing the killer of a 13-year-old boy while standing trial on accusations he murdered a suspected serial killer in cold blood. There are also five children's' pilots, including comedy animation Hardboiled Eggs and Wishenpoof!, about a girl who uses "wish magic" to solve life's problems. Created specifically to help teach pre-school children the importance of resolving conflict in constructive ways, The Jo B & G Raff Show follows two friends who learn how to reach a compromise. The programme has been written by Angela Santomero, creator of Nickelodeon's Blue's Clues, who also wrote one of 2013's successful pilots, Creative Galaxy. Four other pilots were given full runs last year, including political comedy Alpha House and Silicon Valley sitcom Betas. It is the second year Amazon Studios has created original content as the look to compete with the success House of Cards and Orange is the New Black has given rival company Netflix.